Weeding is an operation affecting the whole production cycle and it is so important that extensive farming is still today classified on the basis of the possibilities to carry out this task. let’s see which equipment is best suited for it. Wide row spacing in maize crop makes it the cultivation par excellence for weed control: on one side wide row spaces facilitates weeding operations, on the other side it absolutely requires it exactly because of the wide soil area that, in early phenological phases, remains without vegetation. Weed control can remedy to problems caused, in bare soils, by water resources loss due to evaporation and by the spread of pests. In industrial crops weeding is mostly applied in summer cycle crops with wide row spacing such as maize, sunflower, chard, grain legumes. In horticulture, the crops fit for weed control have plants lined up in perfect spaced rows, they grow erect, they have medium-long life cycle such as berry, tuber, or bulbs crops, but also some head plantations (chicory and lettuce). It follows that most of horticulture crops are subject to weed control. Weeds control has three main objectives: to combat weeds, to reduce water consumption due to direct evaporation from the soil, to bury the nitrogen fertilizer coverage . 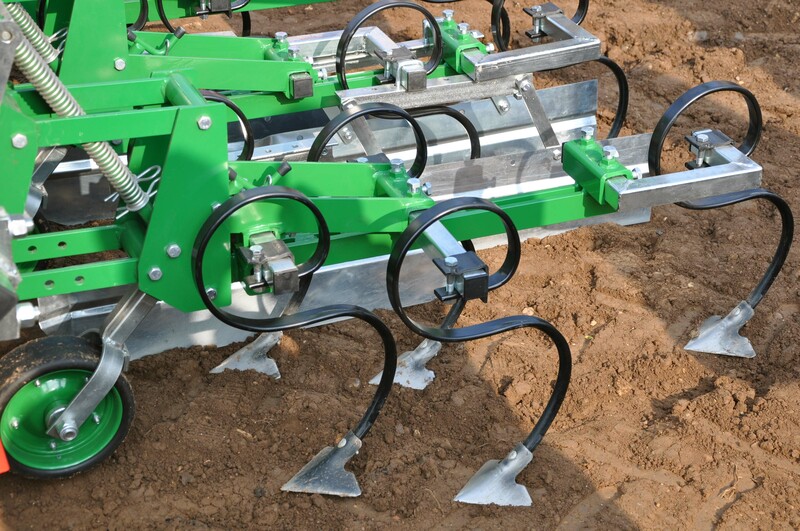 It consists of a mechanical tillage performed through implements that interact with the upper layer of the ground. Usually only the inter-row space is involved, but by using some implements equipped with special tools, also the row, at least partially, can be worked. In this case the common hoe used in inter rows, is integrated and supported by wheel or idler wheel (where motion is generated by contact with soil while moving forward) tools endowed with teeth or other equipment able to penetrate the soil occupied by the row and, thanks to the inclined position in relation to the ground, the equipment can work the soil without any (or only little) damage for the crop. Also the materials of which the tools are made, play an important role: steel or polyurethane material. In other cases the equipment is hydraulically driven and so it amplifies processing intensity. Fig. 1 Typical hoe to weed the inter-row. Mounted on springs, it can get easily rid of stones or clods (Lamola). In order to be effective, equipment must be able to bare the roots of the weed in such a way that the root system loses contact with the soil and shrivels quickly. If it is relatively easy to achieve this in inter-rows, it is not like that for rows where interaction between equipment and soil is obviously less effective. To increase weeds control it is necessary to act when the weeds are young and that is true for all weeders. This is the reason why, when the main target is weeds control, the operation must be carried out just few days after plantation or in urgent need, that is as soon as the culture is independent, and thus repeated till the dimensional advantage of the crop is to the point of prevailing against weeds development. The latest so called “smart weeders”, with electronic systems able to identify cultivated plants and so managing the parts of the equipment in order to keep them midway between the rows (problem of crop row alignment) and the activity of the equipment into the rows (problem of working on the rows). These weeders must also be endowed with very responsive mechanical/hydraulic/pneumatic or electrical devices, able to execute the commands given by the control unit in just a few milliseconds. Weeds control is important for all the crops but it becomes strategical for organic farming. In this sector in fact, mechanical weed control, carried out before and during cultivation, is one of the few weapons at farmers’ disposal, who otherwise would see their cultivations suffering for the exuberant development of weeds. Fig. 2 This kind of equipment, made of polyurethane, enables to operate on rows, by limiting damages to crop. 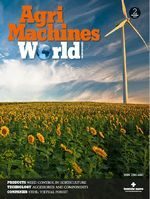 In this case preliminary adjustment and alignment between rows and equipment while operating, are required (Maintech). Thanks to weeder automatic steering systems the operator’s presence on work equipment is no more needed. This system in fact, accomplishes the task of driving the equipment (that normally operates only in inter-rows) so as to avoid the crop row. The farmer work becomes particularly hard when it is necessary to operate on the rows. This results in reduced forward speed and increased frequency of errors thus damaging plants. 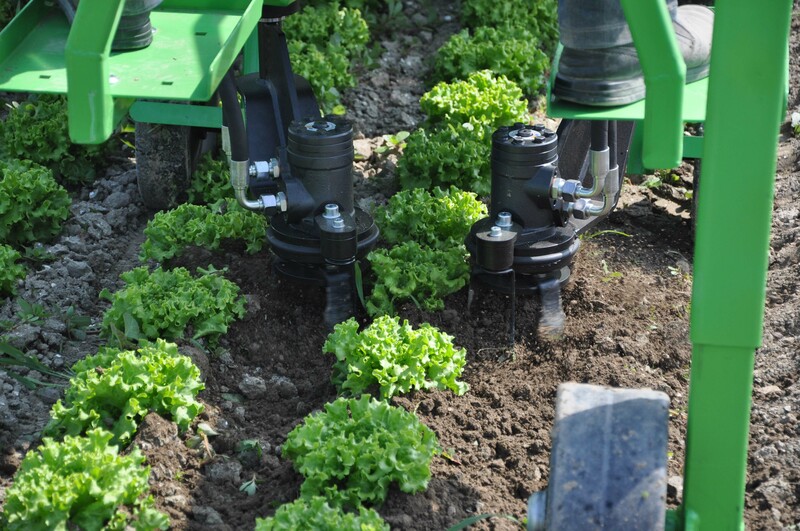 In order to reduce the risk of error, the weeder has to operate in the same number of rows as the planter. In this way equidistance between the rows is assured while it may not be present in inter-rows limited by two adjacent sides. The accuracy of the intervention is related to the distance between the equipment and the row: in extensive farming where weeds control is effective, it may be convenient to operate slightly displaced from the row, thus incrementing the forward speed. In this case, in fact, other functions of this operation prevail. Fig. 3 Vertical toothed wheels and idlers. This implement acts gently on the soil breaking up the surface crust. It is also effective on newly sprouted weeds (Oliver). 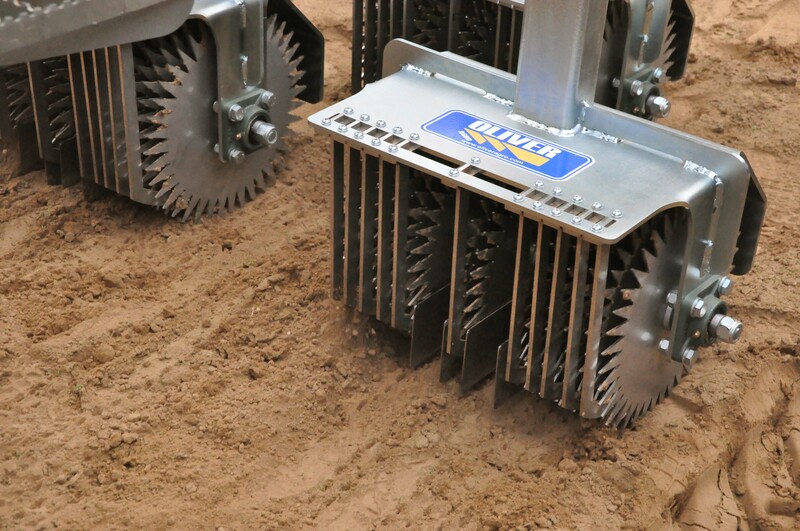 Equipments break up the upper layer of the soil, the first 3-4 centimeters, eliminating the hardpans created after rains (or irrigations) most of all in loam soil or unstructured clay soil. Hardpans breaking up and most of all tillage made by the weeder close the pores through which water stored in the ground flows back by capillarity. In this way significant losses due to evaporation in spring and summer time, are reduced. 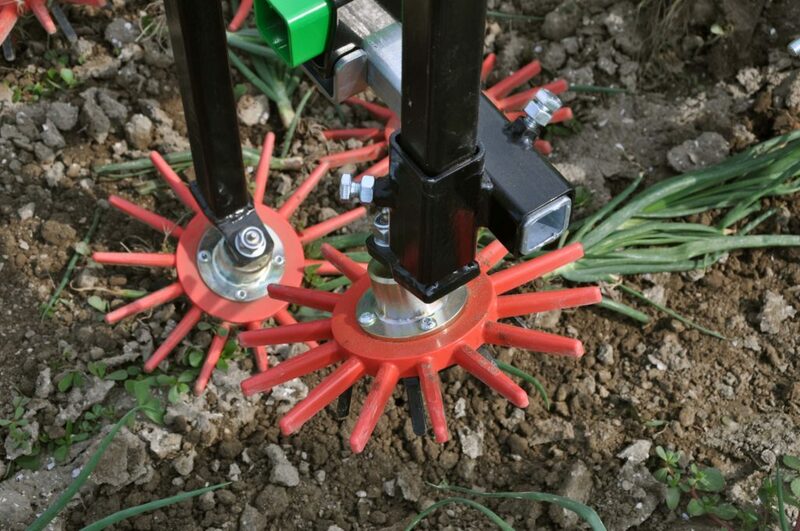 The weeder forms a soil layer that protects the soil beneath and the roots against excessive heat and evaporation. Moreover, this operation allows to mix granular fertilizer usually given during weeding itself, thus considerably reducing nitrogen losses due to gasification (or also due to nitrous oxide formation, a strong climate altering substance) and all fertilizers losses due to run-off caused by heavy rainfall. In horticulture weeding is necessary, but it is also delicate and onerous, so much so that in some cases strategies that help to surrogate it are adopted. Moreover, it is not always applicable. Prostrate cultivations (e.g. melon and watermelon and, generally, cucurbits) make it difficult, if not impossible, to adopt this technique; while it is used, only in early phenological stages, for expanded ground level cultivations (e.g. eggplant, tomato, etc.). A technique alternative to weeder, for weed control, is mulching. Weeds development is prevented and water loss due to direct evaporation is efficiently reduced by covering the soil with plastic or biodegradable films. Mulching is suitable for wide spacing cultivations and transplanting crops. It should also be pointed out the presence on the market of seeders able to operate on mulching films. Fig. 4 Rotor similar to that of a rotary harrow hydraulically driven. The operator controls its position by allowing it to enter the rows in the space between two plants (Fardin). 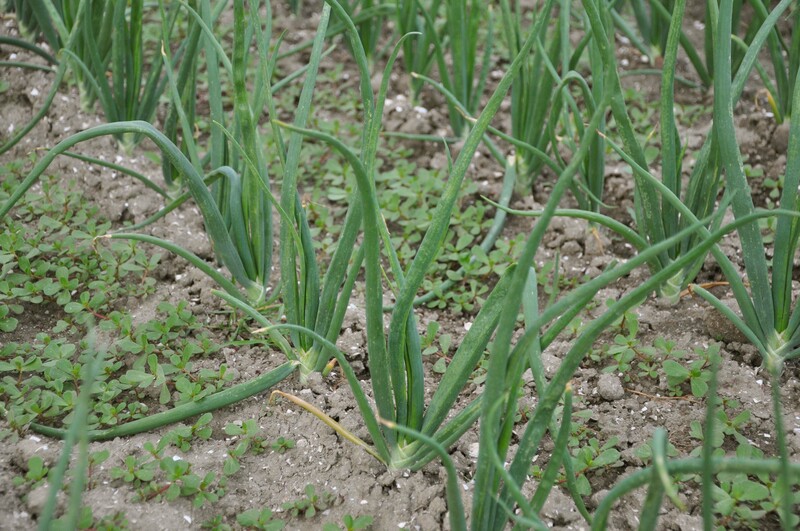 Weed control in horticulture is however a very frequent intervention and it is applied also in dense sowing/transplantation cultures such as alliaceous or horticulture leaf cultivations grown in a row. Salads and chicory, for example, are weeded in early phases, before the growing of the head that reduces the space available for the growing of weeds. Mulching is not suitable for alliaceous due to their dense sowing. In that case weeding is an obligatory step. In horticulture however, an additional action is sometimes requested to weeding: the earthing up of the row as for example in cultivation of potato or of sweet potato. In this case it is more properly called earthing up as the displacement of soil prevails. Earthing up is used also on ridge planting or sowing in beds with the main purpose of preserving it over time. This need is moreover particularly felt in multiannual crops such as artichoke and white Asparagus.